I also wanted to take a minute and explain why I wash my quilts, all my quilts even the ones I intend to enter into shows. There are a couple reasons, one is aesthetics, I like the crinkle look, and the second because form start to finish my quilts get dirty. Take this quilt for example. I finished piecing the top and was ironing it when my daughter came over, sans diaper, stood on the 6 inches resting on the floor and peed, yep peed on my quilt top. I did my best to clean it up but there was no way to wash the quilt at this point. Next, while I was basting my beagle snuck into the room and ran across it with her dirty paws. Finally, while quilting this top my daughter came up to me saying "I don't like it," and set some trash with strawberry jelly on the quilt. Needless to say I HAD to wash this quilt. 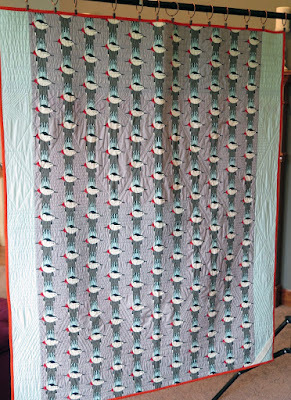 It survived and in true modern quilting spirit it is a functional-usable quilt. 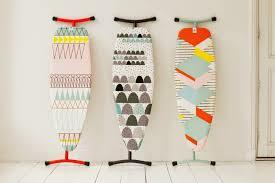 I LOVE, LOVE, LOVE the colors of my ironing board and set out to design a quilt similar in style and color. What really makes this quilt is the quilting and I designed the negative space to feature the quilting. I definitely had some challenges with this quilt. Including taking out entire sections after the top was pieced, e.g. 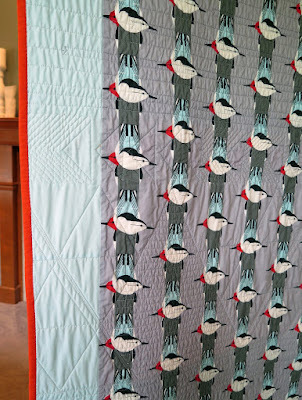 some of the geese, and taking out quilting to try and fix surface distortion. I also used bias tape in the aqua sections to create some textures, which was a technique learned from the Mighty Lucky Quilting Club. 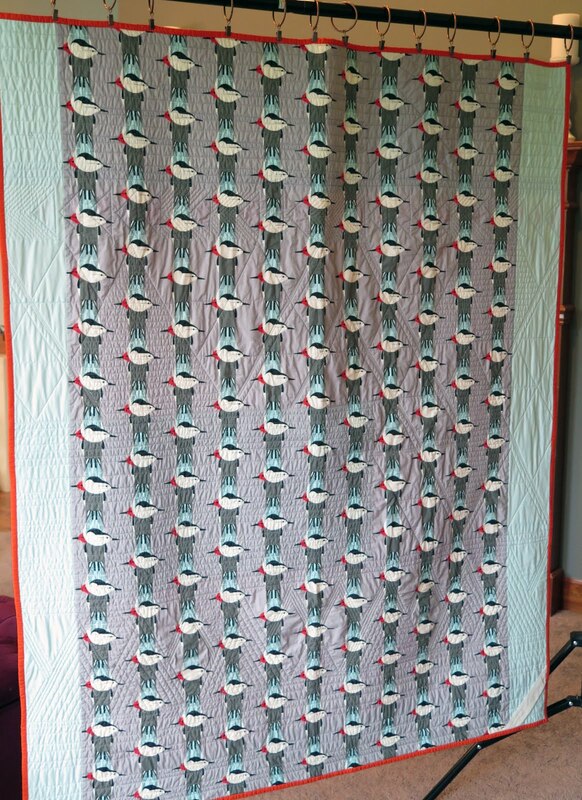 I chose a fabric for the back of this quilt at Quiltcon, Charley Harper Upside Downside by Birch Fabric. I like how this back turned out with the focus fabric down the center with aqua stripes on either side. I think I will submit this quilt along with Modern Stepping Stones and Chevrons Revisited to Quiltcon this year, fingers crossed. 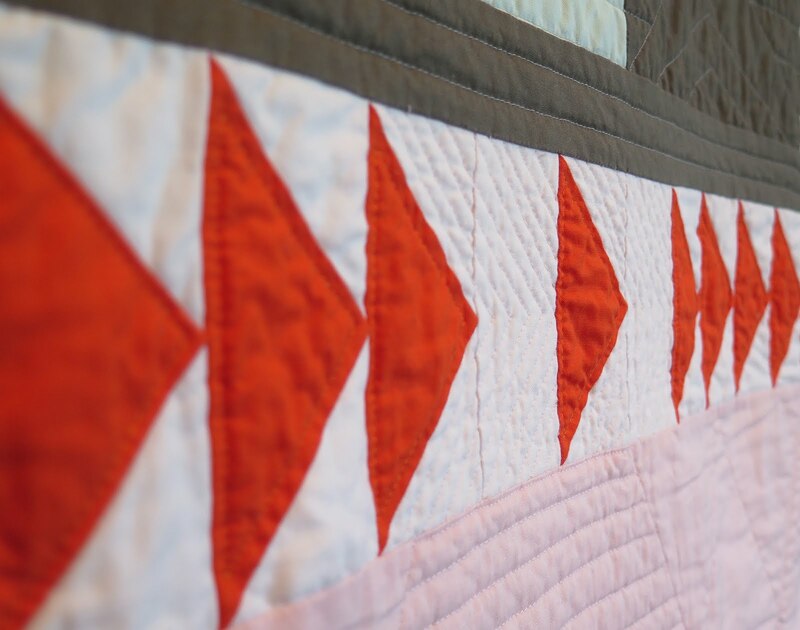 Dear Heather, why does nobody comment your quilts. I jumped over from flickr and I m overwhelmed from your works and your story. There should be lot of people who recognize your works. I will follow you from now on. Thank you for showing all the lovely quilts. Beautiful quilt and quilting Heather! I am glad it survived all the pee, jelly and paws. So am I! Quilting with a toddler can be very interesting. What a fantastic quilt! 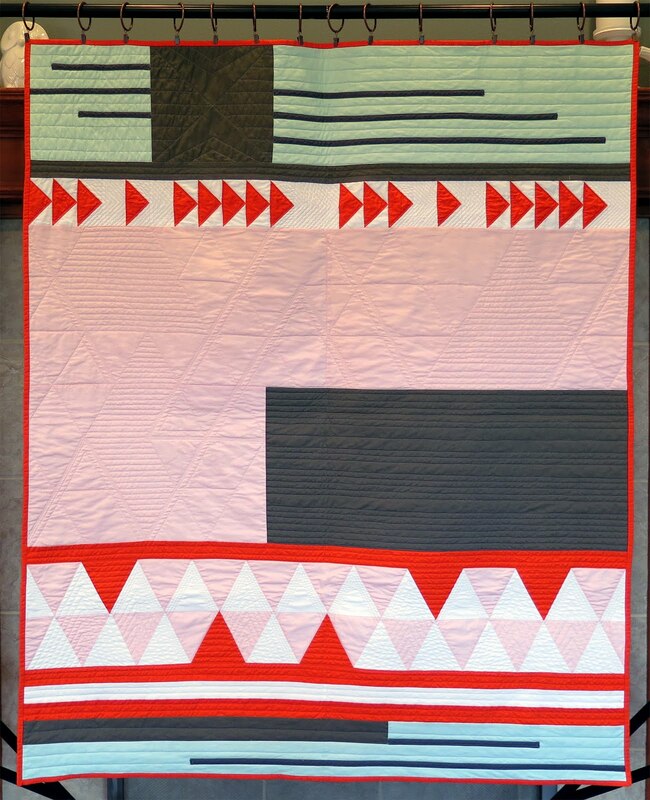 The design pulled me right in from the linky at Blogger's Quilt Festival! Blogs just aren't seeing the same traffic they used to, and most people who read blogs in a reader like Bloglovin' or Feedly just don't bother taking the time to click through and comment. 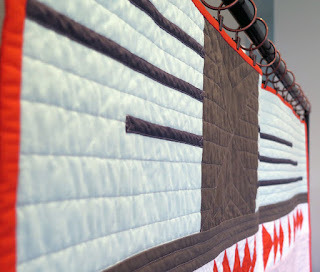 I agree I love reading blogs and seeing quilts and more quilts but I think alot of people stay on Instagram, which I love too but you don't get the stories. Beautiful quilt! 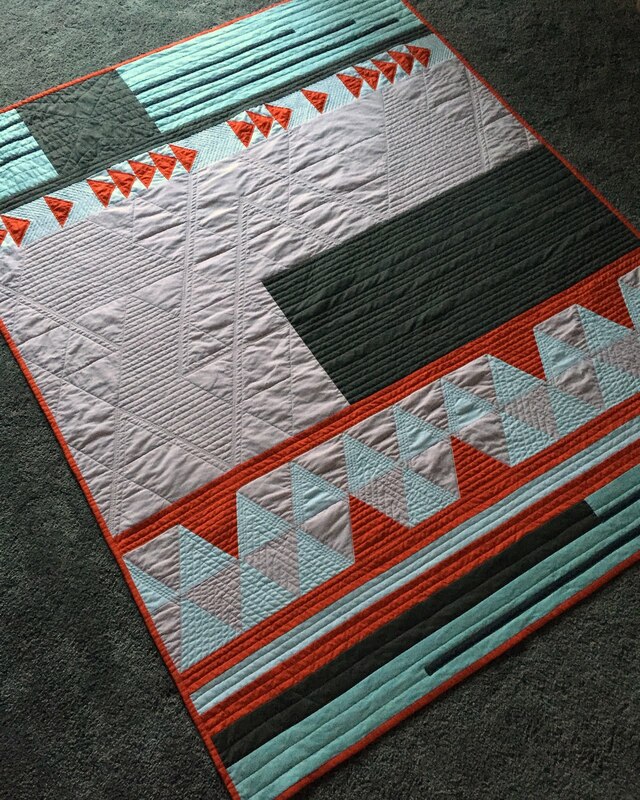 Love the colours and quilting. I experience the same with my relatively new blog, but that makes me appreciate every comment even more so. Thank You! Comments are great I love interacting with other quilters, BTW love your quilts too. Love Charley's fabric on the back. Do you use those color catcher's when you wash your quilts? especially with all that red? I do use color catchers and detergent. I while back I found a great blog post, I wish I would have bookmarked it, where a lady had done several experiments washing different fabrics with different techniques. She found that the one thing that kept the dyes from bleeding was soap! I trust her finding but still thrown color catchers in there to be safe.